2010 July «Suad Bejtovic Photography etc. Suad Bejtovic Photography etc. 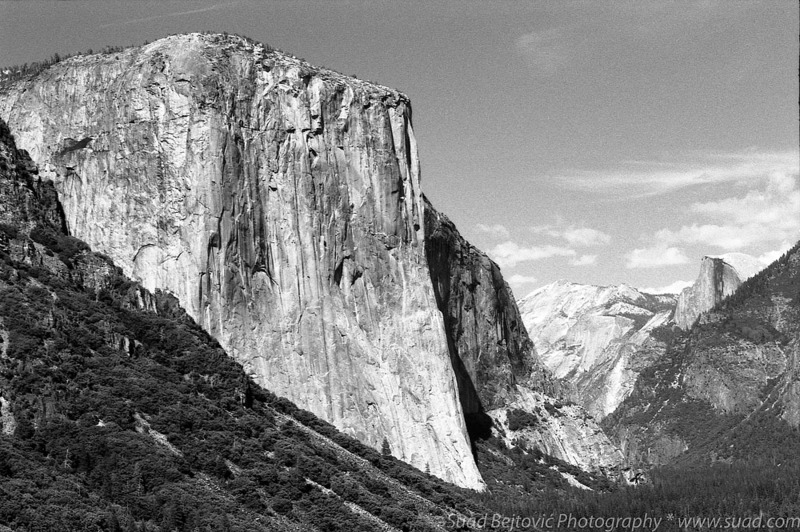 Among the must-have shots in anticipation of the Yosemite trip with Scott, John, and Tyler, very high on my list was “sunrise at El Capitan”. The prominent brow of this massive granite cliff catches the morning light on its southeastern side, and we wanted to find a good spot from which to take in the great rock. We did some beating around the bushes and wandering way off path (in some cases, all of 100 yards from the main valley road! 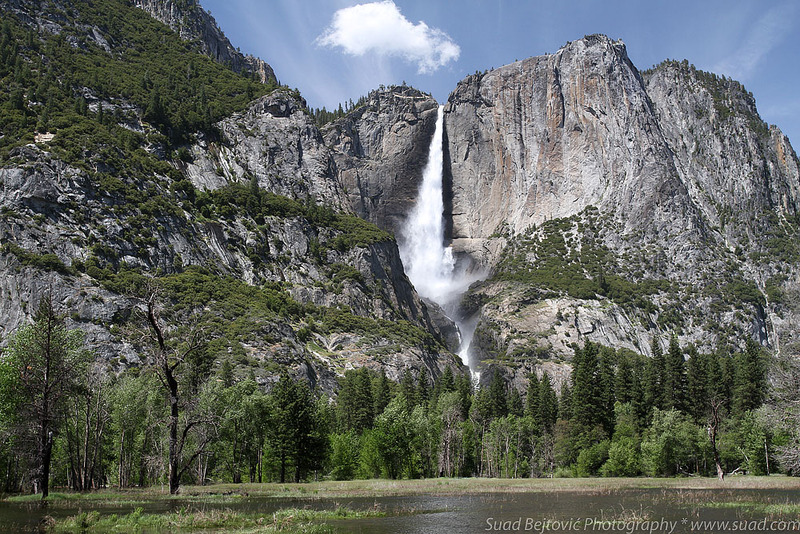 ), but the swollen Merced River wiped away a lot of the meadows and banks where a hopeful photographer would set down his tripod. In the end, we decided on a little outcrop in the river bend, just barely enough for four tripods. Then, we waited. Unfortunately, it was close to the summer solstice, and the sun rose well to the north, so the only part that got that beautiful morning light was this very tip of the cliff. 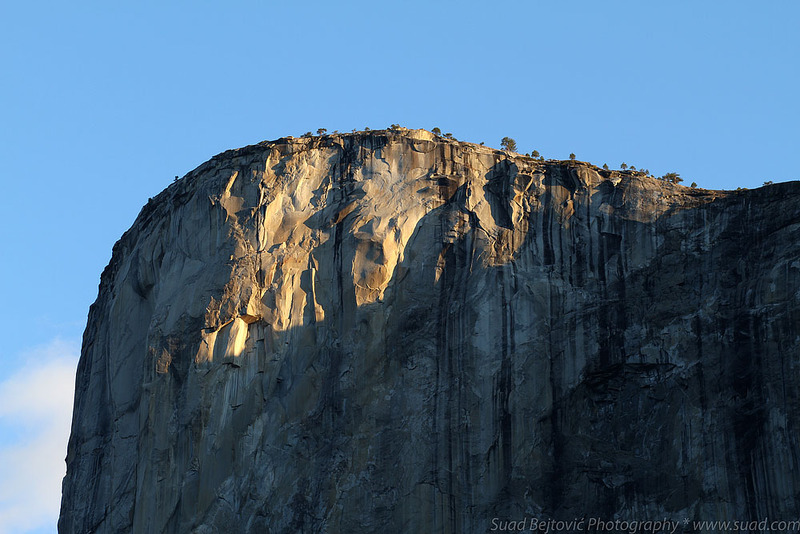 The triangle would extend down as the dawn went on, but the sun would just not shine fully on the face of El Cap until well into the morning. Maybe some of the other guys managed to harness the extreme shadows and the bright highlights better than I did, but my best shot is this closeup of the top, taken with my 7D and the magnificent EF 85mm f/1.8 USM lens, looking almost straight up 3000 feet. As a bonus shot, here’s a wider angle image of the same scene, taken about an hour after the one above. Notice the much cooler, whiter light. And while we ruminated that sun coverage along the cliff might be fuller later in the year (winter solstice? I shudder to think), simply standing by a fast-moving river and watching first light on the largest exposed piece of granite in the world was amazingly serene and thoroughly satisfying. 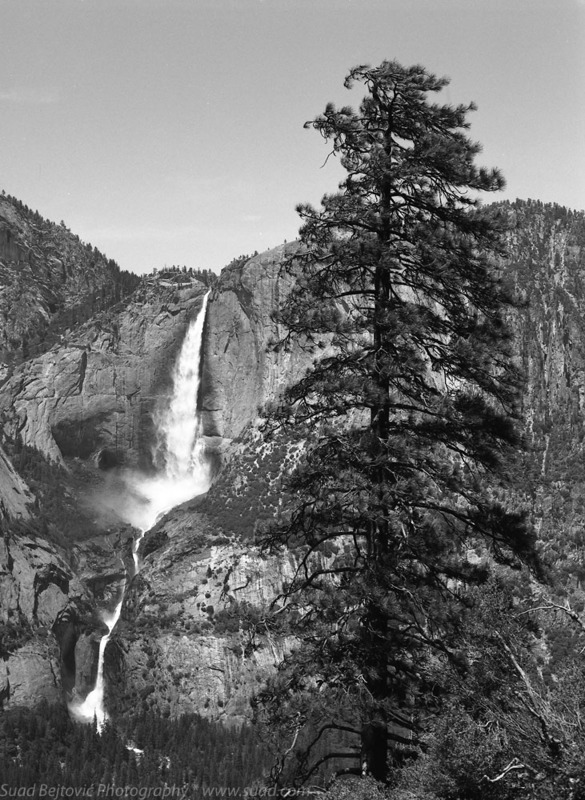 I’ll skip the Ansel Adams quote for this post, as this is basically a paraphrase of one of his most famous images. There was no clearing winter storm this June afternoon when Scott, John, Tyler and I elbowed with the crowd at the most popular vista in Yosemite National Park, the “tunnel view”, so called because this is quite literally the view once you come out of the Wawona Tunnel from the south. 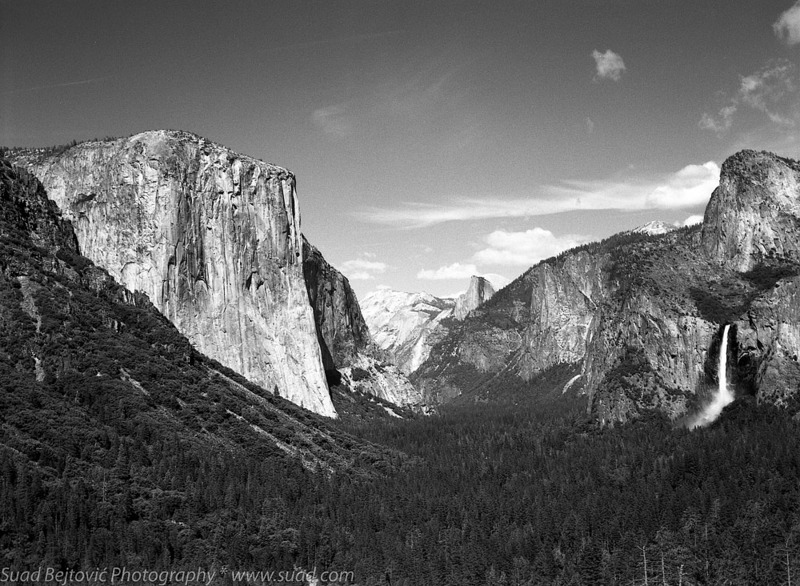 There is no secret for getting a good shot at the tunnel view – just press the shutter. Getting a great shot is a little tougher, especially one that comes close to Ansel’s magic. I had three cameras with me, and although the digital color shots are nice, it’s the black-and-white film shots that caught my eye. There was a great one on Ilford FP4 film in 35mm size, but I wanted to check out the medium format shot. I had lost track of which film I used that day, and it turned out it wasn’t my favorite Velvia in my Mamiya 1000S, but Ilford Pan F instead. It’s the first time I used this film, and I heard rumors about its sharpness, but I quickly became a believer when I saw the scan. It almost didn’t need extra sharpening (which emphasized the superfine, almost non-existent grain), and the image just popped. 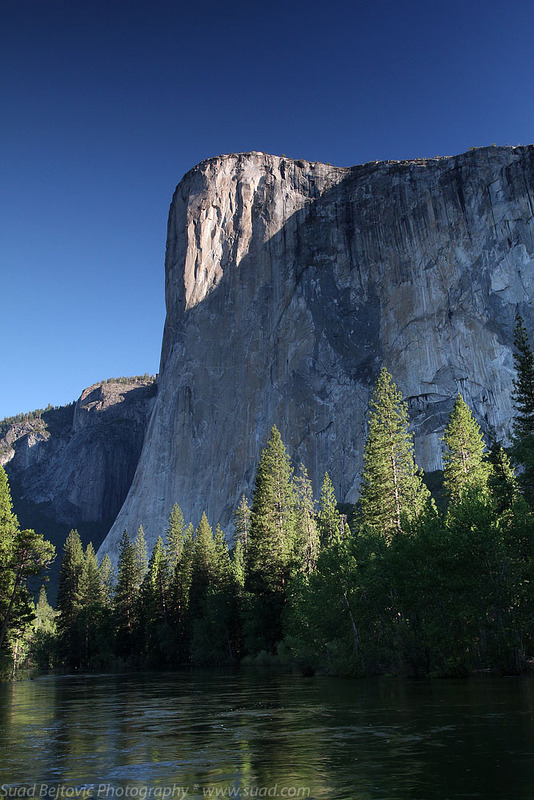 The western face of El Capitan is there in all its glory, except for a tiny overexposed bit at the base. 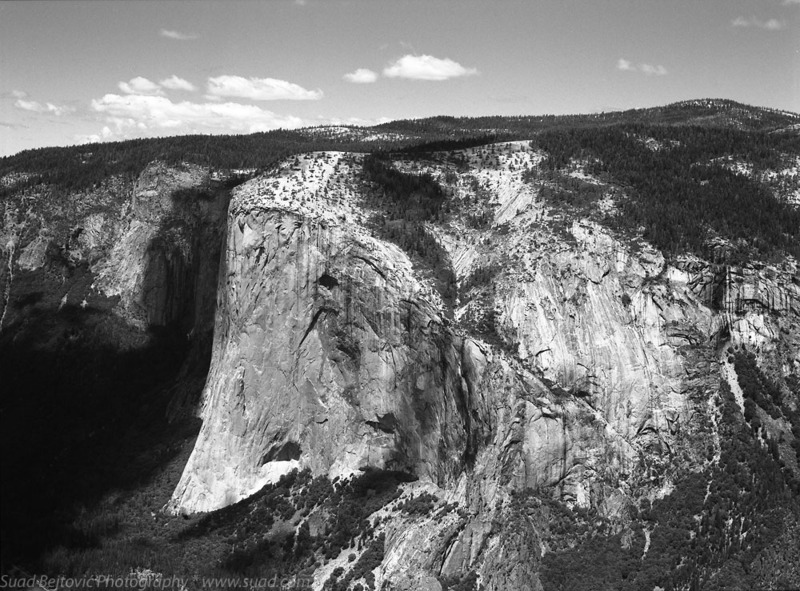 In fact, this was gonna be an El Cap portrait, and I’m also including a closeup of this great rock, also taken from tunnel view. I love this shot just as much, especially since it was taken with my 85mm lens, but I have a different pairing of those two elements prepared for the next post.